Compress WebM videos with super fast speed and no quality loss on Windows/Mac. Reduce WebM file size by changing bit rate, resolution, quality, format, and others. Edit WebM videos with trimming, cropping, rotating, adding watermarks, and other features. 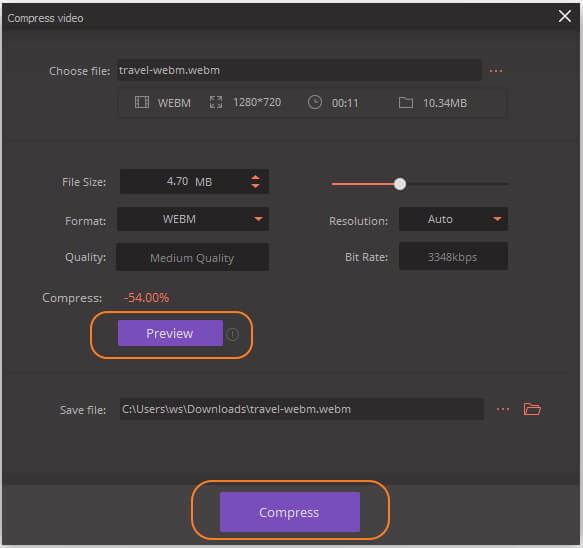 Convert and compress WebM video size in batch process easily. WebM is an audiovisual file format that is based on the profile of Matroska. If you wish to share WebM files over the internet, compress WebM to reduce the file size is a necessary step. How to choose the correct WebM compressor to reduce WebM file size among so many tools? 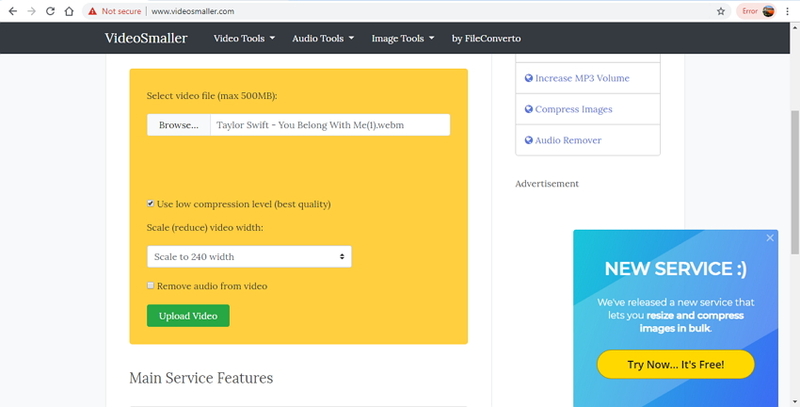 This article can solve this problem for you as the top 5 best ways are selected here, which will help you compress WebM files online and free with simple steps. To make WebM files smaller without any quality loss, we recommend Wondershare UniConverter (originally Wondershare Video Converter Ultimate) to compress WebM video. In addition to WebM, over 1000 popular video and audio formats are also supported by the software for compression and conversion. You can change the bit rate, frame rate, resolution, and quality to shrink the WebM file size and check the compressed video with real-time preview. Wondershare UniConverter has many additional functions like Video Download, DVD Burn, Video Transfer, Fix Media Metadata and more others available on both Windows and Mac system. 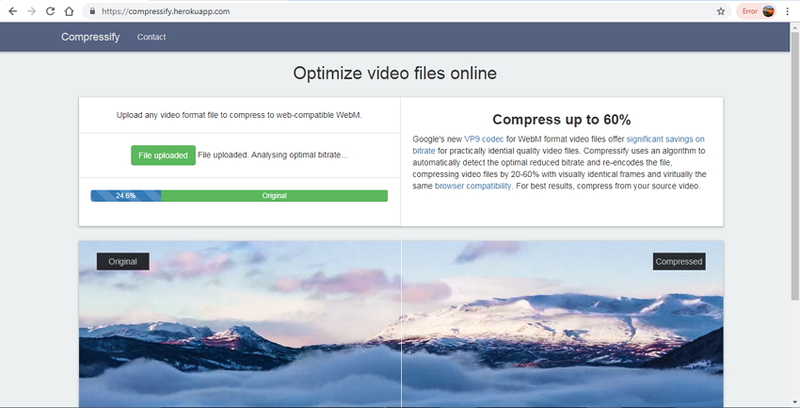 Compress WebM videos by changing video resolution, bit rate, file size, video format, and others. Support 1000+ video/audio formats for compression and conversion with super fast speed and no quality loss. Edit WebM videos by trimming, cropping, rotating, adding watermarks, applying effects, editing subtitles, etc. Check video quality before compressing with real-time preview. Support batch process to compress WebM videos on Windows/Mac. Download videos from YouTube and other 10000+ video sharing sites by one click. Transfer compressed videos from PC/Mac to iPhone/Android/External devices via a USB cable. The first step you need to do is downloading, installing and launching Wondershare UniConverter (originally Wondershare Video Converter Ultimate) software on your PC or Mac. 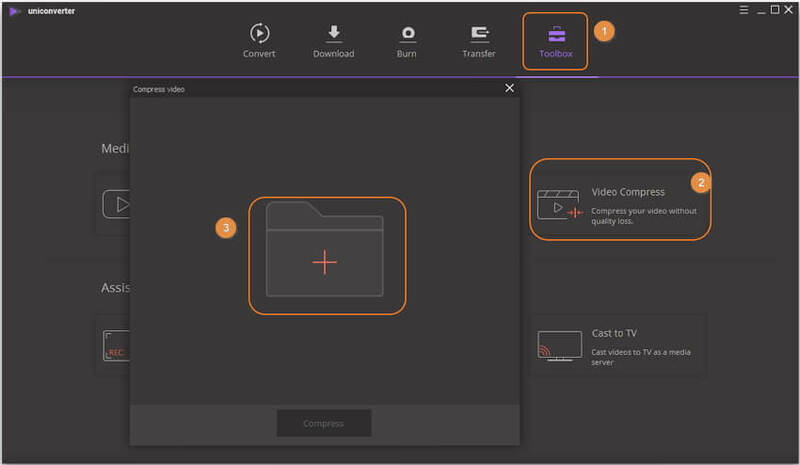 Then select the Video Compress option from the Toolbox tab. To select a WebM file from your PC, click on the + sign from the pop-up window. The added WebM file details are shown on the pop-up window. To compress the WebM video, you can change its mentioned parameters including file size, resolution, and format. Moving the progress bar facilitates choosing the compression percentage that automatically edits the file parameters for compression purpose. To view the WebM video before the process, click on the Preview button. Finally, hit the Compress button to start the process. Online tool helps to compress your files in a simple, quick and pocket-friendly way. Online UniConverter (originally Media.io) is a decent online program that works from the browser without installing or registering any software. Using the tool, you simply need to add the desired video and compress it by selecting its output size and resolution. You can also change the WebM to other formats if needed. This online WebM compressor works super fast and totally free. Step 1: Open https://www.media.io/video-compressor.html on your PC/Mac browser window. Click on the + sign to browse and add a local WebM video to the interface. Step 2: After the video is added, choose the video resolution, output size (in terms of compression percentage) and format of the file. Step 3: Click on the Compress button to start uploading and compressing the added WebM video. The processed file can be downloaded on PC/Mac or directly saved at Dropbox. There are other methods and tools available as well to reduce WebM file size. Listed below are some commonly used. This free to use online program is compatible with Windows, Linux, Mac, and browsers. Using the tool you simply need to add the WebM video from your system that will be compressed with good output quality. The program allows selecting constant rate factor, minimum quality, and maximum quality of the output file. All the content on the program is handled on the cloud servers resulting in a quick conversion process. The compressed files can be downloaded individually or as zip files as needed. Compatible with all platforms and browsers. 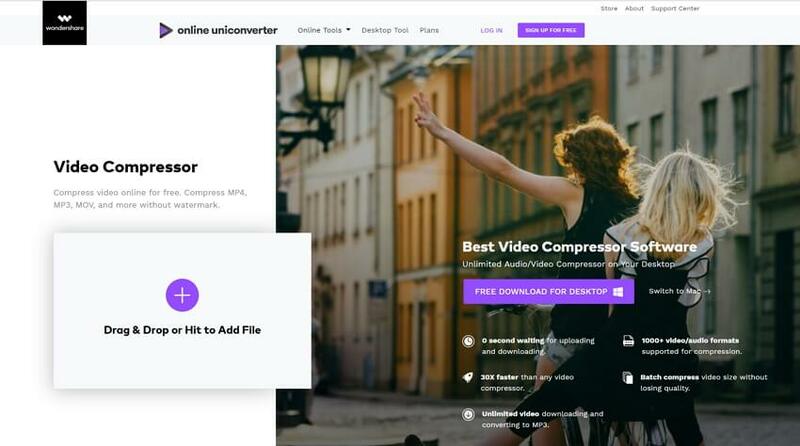 This is another free to use online file compressor that supports an array of formats including WebM, MP4, MOV, AVI, and others. The program needs no download or registration and the process is quick. With the simple interface, the tool is easy to use for all types of users. Maximum of 500MB files can be uploaded to the program for compression. Once the process is complete the uploaded files are removed after some time. You can scale and reduce the width of the video using the tool and there is also an option to use the low compression level to maintain the best quality. Mute video can also be created by removing the audio. Supports an array of video formats. Option to remove audio from video. Maximum 500MB files can be added. Limited options to change the file parameters. Convert your WebM files in high quality using this free online tool. The program used an algorithm that is capable of automatically detecting the optimal reduced bit rate and then re-encodes the file. The files can be compressed by 20-60% with identical frames and maintaining almost the same compatibility with the browser. The process is simple where you just need to add the video and it will be automatically compressed. Maximum of an 8Mb file can be added to the program to reduce WebM file size. Optimal bit rate is analyzed. Maximum of 8MB files can be added. No option for manually selecting the compression percentage or file parameters. WebM and MP4 are two popularly used video formats with their own set of features and specifications. There are a number of differences between the two formats as well. Know more in detail about these two formats. WebM: Developed by Google, WebM is a container format that is based on Matroska and capable of holding videos in high quality. The format is supported in HTML 5 and was thus originally designed for the Web. To compress the videos in WebM format, VP8 or VP9 video codecs are used. The format is supported by all common browsers and can also be used for uploading videos on YouTube and other social media channels. MP4: MPEG-4 Part14, commonly known as MP4 is a popular multimedia container format that is capable of hosting videos, audios, images, subtitles, and chapters in a single file. The format is widely used as it is compatible with almost all types of digital media devices and players. MP4 videos can also be streamed over the net. Advanced content like menus, user interactivity, and 3D graphics are also supported by MP4. Quality: When it comes to quality, MP4 is a little better as compared to WebM. Though both the formats offer high quality, the difference lies in the codecs supported by them. Size: WebM and MP4 both are compressed file formats to reduce the file size for easy storage and sharing. Since MP4 videos are mainly created in order to offer DVD quality files, they can be large in size. WebM videos are mainly used for streaming and thus they are smaller in size. So when it comes to WebM vs. mp4 file size, former is smaller than the latter. Usage and Compatibility: MP4 is compatible with playing on all types of players and devices including smartphones. So if you are looking for video playback, MP4 is an apt format. WebM, on the other hand, is an internet-friendly format that is apt for uploading content on YouTube and other sites. Supported Video Codecs: WebM uses the VP8 or VP9 video codec while MP4 uses H.264 codec.